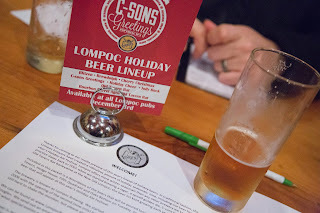 This Monday I attended the Lompoc holiday beer tasting, where this year's seasonal beers could be sampled. The tasting was located at the Side bar which is next to Lompoc's 5th quadrant bar / brewery. Since I was coming from Hillsboro I did not have time to eat after work. I arrived a little early and had a happy hour burger and fries that was an amazing way to spend five bucks and keep myself from getting too drunk off samplers. While waiting for the tasting to start we were offered a "welcome beer" that was released the week before called Entropy Cream Ale. This clear honey colored beer has a weaker but pleasant aroma that transitions into a smooth caramel taste. After the first drink you can feel the silky smooth body with a warm finish. An overall very drinkable beer . After a while the owner Jerry Fechter came up and introduced the brewers Bryan Keilty, Irena Bierzynski, and Grant Golden and talked a little bit about the brewery. Over the night each one would introduce and talk about a couple of the beers to be sampled. I found out that Lompoc was co-founded by Fechter and Portland's most famous publican, the late Don Younger, whose painting adorns the wall above the rustic fireplace at the back of the room. A beer was brewed under this name a couple years ago and liked the name so they kept it but changed the recipe according to Fechter. This slightly hazy golden colored ale smells of cherries. Upon the first sip you can taste the 200 pounds of pie cherries used to give it the unique mild sour taste followed by a hint of apricot. The body of this beer was light and smooth making a very drinkable beer that even sour beer haters could appreciate. Jerry Fechter explained that wine totes were used to brew this beer since they have a large top hole making them easy to get the fruit and beer in and out once tri-clamps and racking arms are installed. A darker amber beer with a slight haze gives off a sweet, malty aroma you would expect from a bock. When drank this full bodied beverage greets you with an assertive and spicy roasted flavor whose presence remains after the beer is gone. The glass I received had little to no visible head which was ok as it allowed the distinctive burnt orange color to be easily viewed. The aroma given out was a bold, cloved and mildly yeasty smell. This beer finishes sweet and malty upfront but has clean almost a minty undertone after swallowed. Not in your face Belgian anywhere but definitely style appropriate. This dark chocolate colored beer was originally introduced in the early 2000's for the Holiday Ale Festival , like most of their holiday beers. The aroma hints at undertones of vanilla not overwhelming or in your face but noticeable over the dark roasted aroma. The body is much lighter than I was expecting for how dark it is. Someone said that it was flavored with 10 oz. of vanilla bean which seemed low unless it was in a barrel but maybe I misheard and they said lbs. The burnt roasted, vanilla and chocolate flavors all merge together seamlessly to a very drinkable beer without one flavor hogging the spotlight. One of two holiday beers available in bottles this year, and my personal favorite. 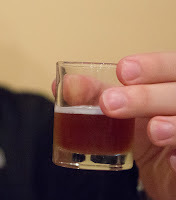 A lightly clouded golden beer with a few bubbles stayed from the pour but had little head retention in my snifter. A bold citrus aroma punches you in the face served up by all seven varieties of C-hops. Drinking this beer was a real treat. The citrus hop aroma that punched you in the nose, apologizes by hugging your tongue with its soft grapefruit embrace and does not let go until long after it has been swallowed. The medium to light body holds your attention long enough to beg for another sip of this hop love fest. As far as drinkability, I would begin a C-Sons Greeting based subsistence lifestyle, if it wouldn't leave me perpetually drunk, fat and unemployed making it difficult to buy more. Named after Don Younger this clear copper colored beer has a sweet caramel nose. The flavor is not what I typically expect from a barley wine. Without the hot alcoholic taste, the sweet, toasted flavor and full malty body make this a very drinkable barley wine. I was going to write my notes from this beer but Lompoc's description says the same thing but much more eloquently and with more history. "Originally brewed in December 2011, this dark amber colored barleywine was aged in Heaven Hill Bourbon barrels for 22 months, then cellared for an additional two. It boasts a soft oak character with raisin and fig notes. 9.7% ABV"
What it doesn't tell you is that this beer is considerably darker than its non aged counterpart and also it has a audacious bourbon aroma and flavor. This beer is for bourbon fans. The strong presence of bourbon is there from the time you smell it until after you have drank it leaving you with the aftertaste of a bourbon shot but without the associated burning. The beer portion of this beverage has a sweet flavor almost molasses or brown sugar with a creamy mouth feel that finishes delicately with a mild sweetness. "This custom blend takes our Big Bang Red aged in Big Bottom Whiskey barrels with 80 pounds of sour cherries for nine months, and blends it with Big Bang Red aged in Maryhill Winery Port barrels for 11 months. The resulting beer is crimson in color, malty in body with notes of cherry and oak, and finishes slightly tart." I was not exactly clear on which beer this one was because the volume level in the small Side Bar had reached boisterous levels during the explanation. A reddish color smelled of cherries with notes of other dark fruit. After a sip you are confronted by the 80 lbs of cherries. This beer is cherry like that's its job (not exactly sure what that means but I wrote it down) The aftertaste loses some of its pleasant cherry appeal and you get some bitterness. Its not quite a kreik, more like the son of kreik whose father is disappointed that he "can't just be more like I am?" The silky mouth feel has a slightly astringent feel to it, astringent may be a little harsh, although it's not just tartness. 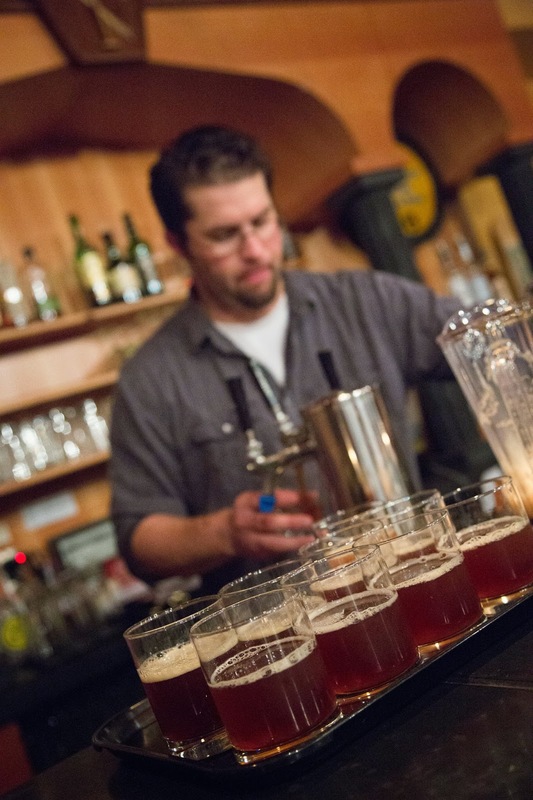 This was a really fun event, I got to taste a lot of great beers that, to my surprise, were all very drinkable. So often Christmas beers are over-spiced or overdone in some way, making you thankful Christmas only comes once a year. However, this is not the case with Lompoc's holiday ale releases for 2013, I would be able to drink multiple pints of any of their seasonal selection this year. Look for Old Tavern Rat and C-Sons Greetings in stores and the rest in their various pubs around town starting December 3rd.